Sarkari job Railway golden opportunity to give jobs to the railway on 10th-12th. HomeJobsSarkari job Railway golden opportunity to give jobs to the railway on 10th-12th. electrician on the basis of contract by the South Eastern Division. Candidates who have passed 10th, 12th and graduation from any accreditation board can apply. Selected candidates will get salary according to the criteria. This post will give the candidates an opportunity to get a good experience. To apply for this post, the candidate must have 10th, 12th and graduate passes from the recognized board. The age limit for this post has been kept for 15 to 24 years. 100 application for general and no application fee has been fixed for SC, ST, PWD, female candidates. 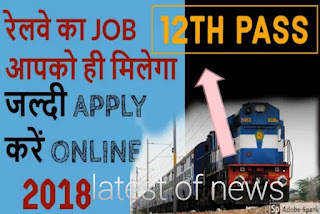 How to apply - Interested candidates can apply with all their documents before 22nd November 2018, from IndianRailways.gov.in website.